While anyone can install the packages that turn Ubuntu into a rudimentary version of Ubuntu Netbook Remix, Ubuntu founder Mark Shuttleworth says the ultimate goal is to ship cheap laptops with the open source operating system preloaded. And the company is working with several PC manufacturers to make that happen. Shuttleworth says Ubuntu Netbook Remix won’t be an official Ubuntu edition like Kubuntu or Edubuntu. Rather, UNR will be maintained by the Canonical OEM team, working with PC makers. Each individual PC maker may have a slightly different version of the operating system designed to work well on the company’s hardware. So while Ubuntu typically has to examine the hardware of a system upon installation to determine the best drivers to use, Ubuntu Netbook Remix should work out of the box because it will be preinstalled on that box. Canonical hopes that by developing custom versions for different hardware configurations, Ubuntu Netbook Remix will be able to boot in as littled as 5-10 seconds depending on the computer hardware used. Ubuntu Netbook Remix won’t be officially launched for another few months, but Shuttleworth says it will probably be updated in October when Ubuntu 8.10 Intrepid Ibex is released. But Shuttleworth says the update won’t be the responsibility of the core Ubuntu development team, since the remix will be handled by the OEM team. It’s also important to note that these custom OEM images may included proprietary software, which means you won’t necessarily be able to download and install the software from the web, but will instead have to get restore/installation discs from the computer manufacturer. 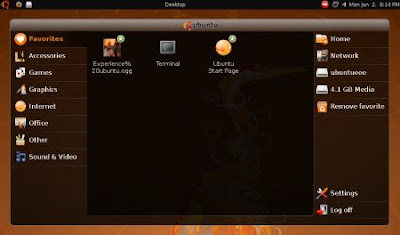 Shuttleworth also hints that at least two PC makers could release computers with a version of Ubuntu Netbook Remix that looks dramatically different from the screenshot above. Canonical is working with these companies to design alternative user interfaces.